As an Arts and Letters major I take great delight in reading hundreds of pages by multiple authors that cover a variety of topics, finding the common threads in all of them, synthesizing the most important points and finally focusing in on crucial themes. Though it can be a somewhat taxing process – one that a person might be tempted to skirt by seeking summaries – it does involve an element of excitement and discovery when that “light bulb” moment comes and things just begin to make sense and fit together. Carrying over this practice of finding common themes over to my life in relationship with Christ I’ve noticed that trust has been coming up over and over again. Perhaps it has something to do with the fact that I’m a second semester senior and really have no idea what I’m doing next year. It’s comforting, I guess, to say “I trust that something will work out,” but stopping there would be selling trust much too short. 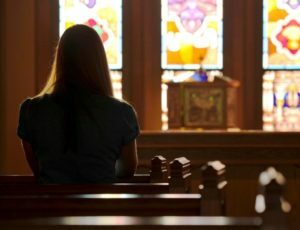 The simple prayer, the mere five words Jesus, I trust in you have kept me rooted in faith despite all of the heartache, uncertainty, restlessness, and doubt that comes in college. Though sometimes I believed it and other times I struggled to do so, I’m learning more and more that cultivating trust in Jesus has impacted my time at Notre Dame more than I will probably ever know. When I felt lonely and isolated and absolutely overwhelmed as a freshman who didn’t know anyone, I prayed Jesus, I trust in you. I trust that you have brought me to this place and you will not abandon me. When I was rejected or things didn’t go according to my plans, I surrendered and said, Jesus, I trust in you. I trust that your plans are greater than my own. When I felt heartache and hurt I turned to Jesus and cried, Jesus, I trust in you. I trust that You will bring healing and peace in your perfect time. In schoolwork, in summer experiences, in community, in friendships, Jesus has asked me to trust in Him, to trust in His plan, to trust that He is who He says He is and works all things for my good (Romans 8:28). And He has shown me that this trust, this hope in Him does not disappoint (Romans 5:5). He has opened windows when doors closed. He has led me to friends that make me more of who He created me to be. He has healed brokenness I never thought possible. He has helped me find a community I feel so blessed to be part of. Cultivating trust has not meant my life is somehow magically easy and smooth: I still have lonely moments; I feel uncertain; I definitely haven’t learned to avoid hurt or heartache. And yet cultivating trust has transformed these things from being mere obstacles in faith to occasions for my faith to grow stronger. Taking trust in Jesus seriously has been one of the most painful things I have ever opened myself up to but it has also given rise to a peace and joy and confidence in knowing that I am loved, protected, and never left alone. The theme of trust in my life is very much a daily endeavor, a work in a progress. I must constantly remind myself to trust in Jesus. The following prayer has helped me to nourish this trust, to make it more and more a part of my life. I pray that in some way it might do the same for you. I think about these words from Constitution 8 of the Congregation of Holy Cross every day as I drive onto campus and begin my search for a parking spot. Statistically speaking, there won’t be an open spot for me at the front-most part of the lot. Considering it’s already 1 p.m. and I’m just getting to campus for my first class, I probably don’t deserve one. But this is a Holy Cross institution, and I’m a man of hope! So you better believe I make a pass through the section with the best spots, even if prior experience says I’m wasting my time. As Notre Dame students, we hope for a wide variety of things. We hope for a seat near an outlet at the library, we hope the line at Starbucks is short, and we hope to win a coveted RecSports championship tee shirt. We hope that we can score a ticket to the Keenan Revue, a date to a Dome Dance, or a part in the PEMCo show. We hope that our duct tape and plywood vessels don’t sink in the middle of the Fisher Regatta. We hope that the Irish will do better than 4-8 next season. We hope we can manage to finish two problem sets, an essay, and an exam by the end of the week. We hope for good grades, good internships, and good jobs when we graduate. We hope that we can find the time to enjoy all of the things this great university has to offer us. But sometimes, I think, I have hoped for so many things at once that I started to lose hope altogether. I allowed my hopes to transform into stress, and forgot to have hope in the most important thing, or rather, person. 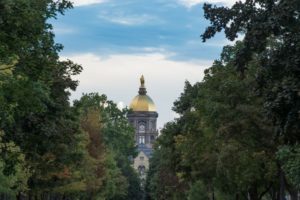 All these things that a Notre Dame student hopes for are good things, but the men who wrote the Constitutions of Holy Cross weren’t talking about hope in tee shirts or tickets or even parking spots. 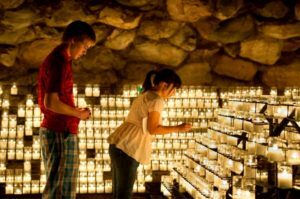 They were speaking of hope in the person, Jesus Christ, who transcends and fulfills all of our hopes. 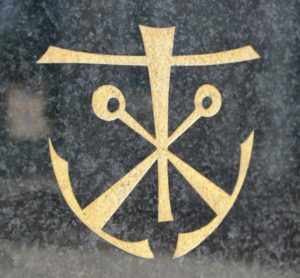 The Cross and Anchors is the symbol of the Congregation of Holy Cross. It represents hope in the Cross of Jesus Christ as our one true hope. I’ll put my hope in that!